High Art: Were Botticelli's Venus And Mars Stoned? A curious piece of fruit in the corner of a famous Renaissance painting has caught the eye of art historian David Bellingham. He suspects that 15th century master Sandro Botticelli depicted datura stramonium, a plant that's also known as "poor man's acid." Datura stramonium — also known as thorn apple or loco weed — is a hallucinogen that produces similar experiences to LSD. Among the priceless pieces in London's National Gallery is a painting by 15th-century master Sandro Botticelli. The canvas, called Venus and Mars, depicts the titular deities lounging in a meadow. Venus looks forward while Mars lies beside her, apparently asleep. ... Or is he? Recently, art historian David Bellingham came to a different conclusion. He noticed that Botticelli painted a fruit in the bottom right-hand corner of his canvas that looks a lot like datura stramonium, a plant that's also known as "poor man's acid." In short: Mars might be stoned. 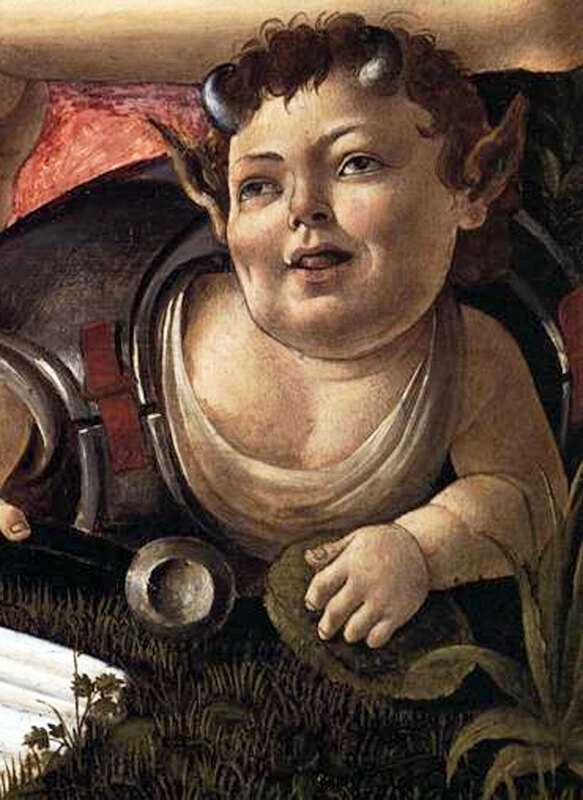 When examining the painting initially, Bellingham tells NPR's Guy Raz that he was intrigued by the fact that Botticelli chose to surround the gods with "devilish, mischievous satyrs" rather than innocent baby cupids, the cherubic figures that usually accompany Renaissance scenes of these deities. An oddly devilish satyr in the painting's bottom right corner piqued Bellingham's interest even further. To begin, Bellingham says, "He had his hands on this curious fruit that wasn't familiar to me." Additionally, the satyr is "playing inside of the breastplate of the so-called Mars. He's on his belly, which is very unusual. And also, he's sticking his tongue out at us rather like a snake. So that made me suspicious." The art historian turned to scholarly literature to see what others had made of the curious satyr. Oddly, though, Bellingham found that "people had either completely overlooked it or that they'd kind of footnoted it and said it might be some sort of citrus fruit or fig." Unsatisfied with this explanation, Bellingham took to the Internet and the British Library. Eventually, he came across a picture of datura. Struck by its similarity to Botticelli's fruit, Bellingham brought the picture to a greenhouse in London's Kew Gardens and showed it to some botanists there. One of them immediately identified it as datura, apparently solving the mystery once and for all. A curious little saytr in the corner of the painting is sticking out his tongue like a snake -- "that made me suspicious," says art historian David Bellingham. Bellingham looked up 18th century accounts of the drug to get a better sense of its effects. "Basically, it produces similar experiences to LSD," he explains. "It's been likened to the effects of opium mixed with alcohol. It can produce a great deal of thirst, hallucinations," and even "speedy chattering." As a datura high is wearing off, Bellingham says, the user eventually "swoons and falls asleep" ... kind of like Botticelli's Mars? The datura hypothesis is not definitive. Some botanists think that the plant is indigenous only to the Americas, and art historians estimate that this painting was completed in the 1480s. As Bellingham points out, "Columbus didn't get to America until the next decade." 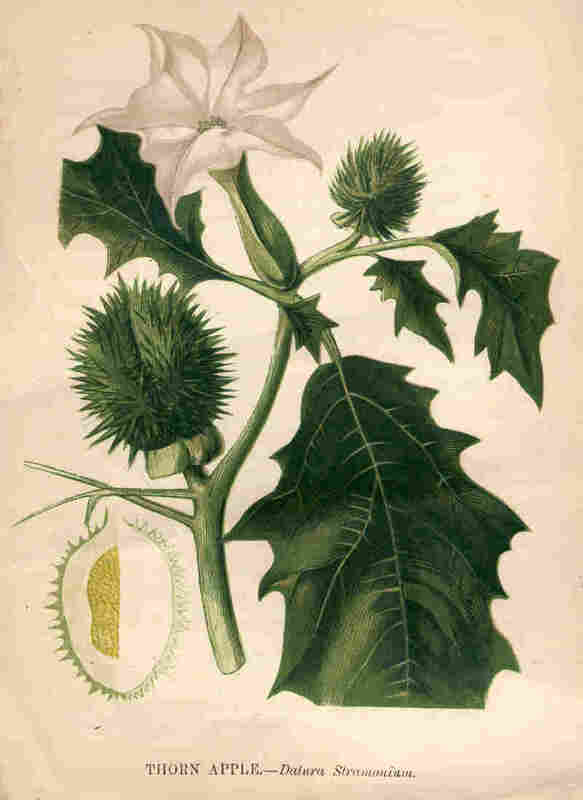 There is an opposing theory, however, that posits datura may also be indigenous to India. In that case, says Bellingham, it "would have been brought across to the Mediterranean, possibly in the Greek and Roman periods," and Botticelli may have known of its existence. How could this element of Mars and Venus have been ignored by scholars for centuries? Bellingham's theory is that most art historians tend to pay close attention to "the more obviously human elements" of paintings while ignoring the "flora and fauna." "I think they probably think that Botticelli is probably just making a pretty frame to the painting," Bellingham says. But regardless of whether Mars is actually coming down from a drug trip, Bellingham wants to emphasize that he's "not that interested in just that part of the painting." Instead, Bellingham is trying to show that this piece can be interpreted in a manner of different ways. Some historians believe that the figures purportedly representing Mars and Venus are actually portraits of real lovers, contemporaries of Botticelli himself. Bellingham suggests they may also be stand-ins for Adam and Eve, while the datura may be playing the role of that fateful apple. In the Bible, he explains, the fruit Eve gives her mate "is never labeled as an apple." In fact, other artists have also chosen to represent the forbidden fruit in different ways: On the ceiling of the Sistine Chapel, Michelangelo has his Adam and Eve "holding a fig." Bellingham also believes the couple could be read as representing another pair of famous maybe-lovers: "Mary Magdalene the prostitute and Christ deposed on the cross." Datura or no datura, this is what Bellingham truly hopes 21st century art consumers will take away from the painting: that it can "be read on all those layers of meaning."